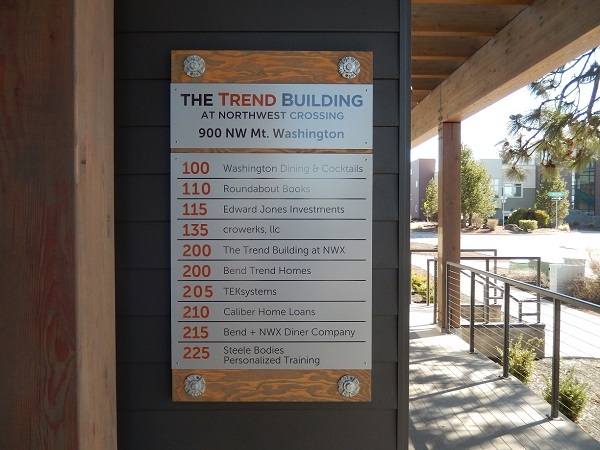 Custom wayfinding signs and directories will improve your interiors and make it easier for workers, visitors, and customers to find their way around your complex or facility. Blue Barrel Signs understands how important it is to have these markers installed. This is why we work with your budget and your venue to come up with solutions that are specifically tailored to the needs of organizations in Central Oregon. 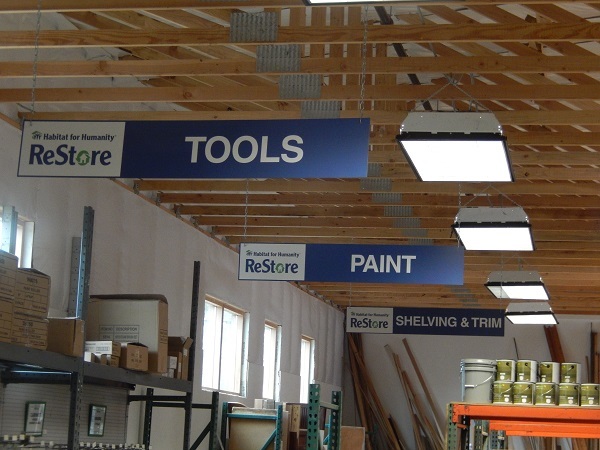 Overhead Signs – Wayfinding markers are not very useful if people cannot see them. This problem is solved with blade signs that attach to your ceiling. This will allow you to present wayfinding information above the heads of guests to your school, store, medical facility, or office. Even if there is a lot of food traffic in your hallways, it is still easy to read directions. Pylons – There are two, three, and four-sided freestanding pylon options. They can feature your unique branding and combine arrows with text. Aluminum and acrylic will give your interior design a modern appearance. 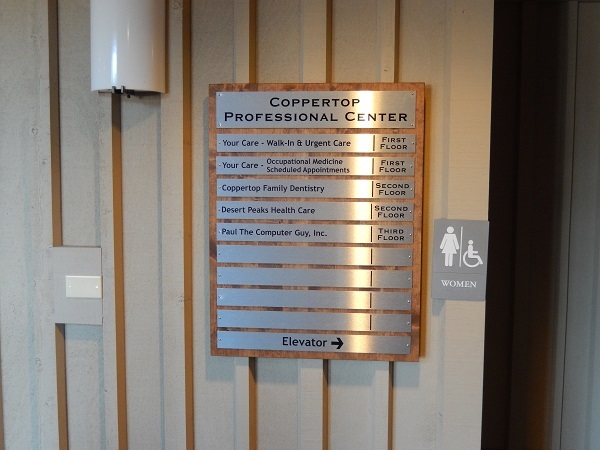 Wall Signs – For most facilities, there are standards set out by the Americans with Disabilities Act (ADA) that govern how and where your wayfinding signs must be mounted. Even though these signs must feature proper typefaces, symbols, and color contrasts, you can still add your custom branding and other design elements. Directories are usually installed in a building’s foyer, in an office’s reception area, on the elevator wall on each floor of your building, and at hallway intersections in schools, government buildings, and hospitals. Freestanding kiosks are an excellent solution near your entrance where they can get the attention of all who enter your facility. These pylons can feature information on both sides, and your directory information can be displayed as lettering on glass, via vinyl overlays on metal, or with acrylic blades. Engraving is also an option. Another popular directory solution is connecting multiple blades to a point and having them point the way to various rooms and amenities. The floor number, your logo, or your company’s name can be on display in the middle where the panels meet. Easily-changeable, wall-mounted directories are also a favorite. There are slot displays with changeable panels or snap frame products with inserts. A larger marker than what you currently need will give you room to grow. Ready to order wayfinding and directory signs? 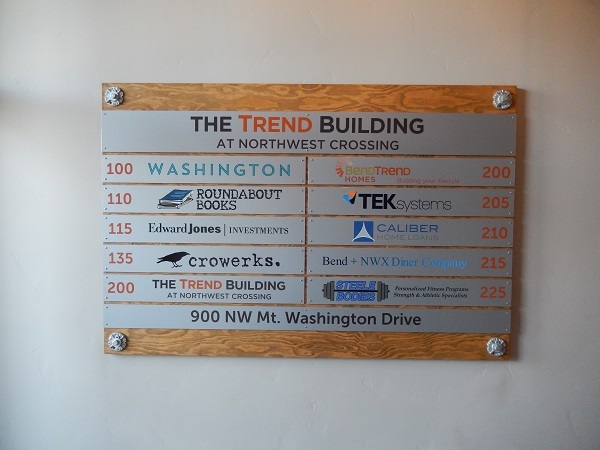 Blue Barrel Signs is proud to serve Prineville, Jefferson County, Redmond, Crook County, Sisters, Deschutes County, La Pine, Madras, and the rest of Central Oregon with wayfinding and directory sign maintenance, design, repair, installation, and fabrication from our headquarters in Bend, Oregon. If you would like to learn more about what we can do for your business, contact us today for a free consultation on wayfinding and directory signs.